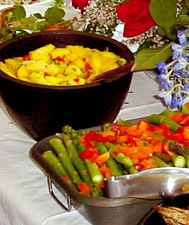 At Bay Area ServSafe®, we teach the ServSafe® food safety training program. This course was created by the industry, for the industry. The ServSafe® food safety training program is administered by the national Restaurant Association Educational Foundation (NRAEF). The course we offer covers all important food safety and sanitation requirements that affect businesses which serve food, as specified in California Law AB 1978. The California Law states that each food facility shall have an owner or employee who has successfully passed an approved and accredited food safety examination.